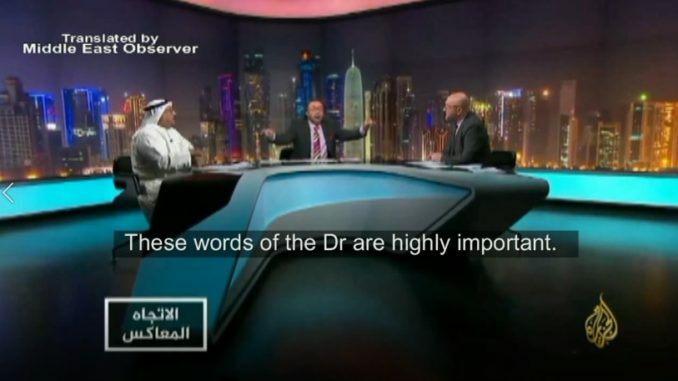 On a recent episode of a popular Al Jazeera political show, pro-Saudi analyst Ayid al-Manna and pro-Qatari analyst Ibrahim al-Hamami engaged in a heated duel over the issue of normalisation of relations between Arab states and Israel. The two argued over which normalisation of ties with Israel was more dangerous, the one being carried out by Gulf states like Qatar and Oman, or the one being pursued by Riyadh and its Crown Prince Mohammed bin Salman. In the thick of things too was the show’s host Faisal Qasim, who overall appeared to side with al-Hamami. Faisal’s pro-Qatari approach comes as no surprise though, when considering that the Al Jazeera network is funded by the state of Qatar. – Help our work continue to grow with even $1/month through our Patreon page. – Host: You are an academic before being a journalist. – Host: Dr, the whole Islamic world from Jakarta to Baghdad is calling on Saudi Arabia to come out and say that Trump’s comments are completely false. Trump says that you are the number one supporter of Israel in the region. My friend, this is a dangerous accusation Dr, you are an academic! – al-Manna: My brother, the actions of Saudi Arabia are enough, there’s no need to refute (these comments). In a direct challenge to the US President, King Salman called the Dhahran (summit) the ‘Quds Conference’, after (Trump) moved the embassy to al-Quds. This is the nature of the Saudis. They let things be, ‘say what you want’. Not just (the Saudis), many states get accused of things, (they) let the truth reveal itself in due time. Faisal, if the people of the Gulf decide to normalise (relations with Israel), they won’t hide themselves. Some guys have (already) normalised: Netanyahu visited Oman, what’s the problem?! – Host: And Qatar also received the (Israeli) athletes…. – al-Manna: And Qatar received Tzipi Livni, and (Shimon) Peres, and (Israeli) athletes, right?! And you, you in Al Jazeera, you are the first to enter Israeli homes! – al-Manna: Yes, the Al Jazeera (channel), during your t.v. programs! – Host: Okay, okay, one minute please, this is a very important point. These words of the Dr are highly important. Why are you (making a big problem) for Saudi Arabia? A few days ago, was there not an Israeli sports team here in Qatar? In Qatar! Why don’t you talk about the normalisation of ties between Qatar and Israel? Why don’t you speak about normalisation between Israel and Oman? Between Israel and Bahrain? e.t.c. Why are you only focusing on Saudi Arabia? – al-Manna: Bahrain has not normalised yet. – al-Manna: It hasn’t happened yet. – Ibrahim: All forms of normalisation are rejected and condemned, and I condemn the (visit) of the sports team to Doha. The difference though, is that I can oppose this in the heart of Doha, and I wont be kidnapped, killed and dismembered like Khashoggi. The opposition to normalisation exists in Doha publicly without any arrests occurring. – Host: So you wish to say that the other Gulf states do not call themselves the ‘Land of the Two Holy Mosques’, nor raise the banner of Islam, nor refer to themselves as the Qiblah of the Muslims? – Ibrahim: Rather, it uses all this as I said…(bin Salman) is changing the (Muslim) psyche. All official normalisation efforts till now are rejected by the populace, in Egypt and Jordan there is no normalisation on the popular level. – Host: And (those efforts) are not important compared to the Saudi normalisation. – Ibrahim: Yet what bin Salman is looking for is popular normalisation, that’s why he launched his (social media propagandists) everywhere, to change the psyche so that popular normalisation is accepted and the (Israeli) occupation becomes regionally accepted. We also see him trying to justify the occupation’s actions via religious fatwas (of their scholars), and they relied on an old fatwa for ibn Baz which permits ties with Israel even if it exploits Muslim lands, and bin Salman also helps legitimise the occupation and break the BDS movement and improve (Israel’s) image. (He) also forces normalisation on others! Meaning that the normalisation (process) today is completely different to the past. al-Manna: When Netanyahu visited (Oman), why didn’t you make a show on it and shout with your loudest voice? Why didn’t you raise your voice? – Host: And Qatar is not important! – al-Manna: No they are all important! – Host: And Kuwait is not important! – al-Manna: I swear to God if there positions were like that of Saudi Arabia (you would have completely defended them)! – Al-Manna: Then do a show about them! Why don’t you do one?! – Host: I brought up the issue of Qatar my friend, not you! The issue is that Saudi Arabia is different. Qatar does not claim to be the Land of Monotheism, nor the (Land of Islam) nor the Qiblah of the Muslims. – Host: Is Qatar the Land of the Two Holy Mosques? No it is not! – al-Manna: It is a Muslim country, they all raise the flag of (Islam)! – al-Manna: The Land of the Two Holy Mosques doesn’t mean it can’t have relations with other states! The Land of the Two Holy Mosques is the one that provided Muslims all their needs and secured them.